The title is a line from the song “The Heart of Worship” by Matt Redman. In the song, the singer re-commits himself to seeking the Heart of worship — “It’s all about You, it’s about You, Jesus.” This song came to mind when I ran across a blog post of Msgr. Charles Pope titled “The Perils of the Pious: How the Devil Can Hijack Holy Practices.” The post is too good for extended comment and I encourage you to read it as it is well-written and insightful (although I have a slightly different take on some things). The fact is, being better than a prostitute or a corrupt city official is not the standard that’s going to get us heaven. The standard that we must meet is Jesus Christ. Now if we really grasp this and understand how far we are from meeting that standard, then we will humbly cry for mercy. But the peril of the pious is to compare ourselves to others, not to Jesus. Too easily we can become smug and superior, arrogant. We can become unaware that we too need boatloads of grace and mercy to even stand a chance of getting to heaven. A secular source (the name of which I no longer remember) observed a sort of grade inflation when it came to going to Heaven. Nowadays, we say “So and So” was jolly good fellow so “of course” he went to Heaven. Perhaps, it wasn’t so easy in the dark, tough past of the early 20th century. I think the speaker and Msgr. Pope are saying the same thing. I suppose it was of those people Christ was thinking when He said that some would preach about Him and cast out devils in His name, only to be told at the end of the world that He had never known them. And any of us may at any moment be in this death-trap. Luckily, we have a test Whenever we find that our religious life is making us feel that we are good—above all, that we are better than someone else—I think we may be sure that we are being acted on, not by God, but by the devil The real test of being in the presence of God is that you either forget about yourself altogether or see yourself as a small, dirty object. It is better to forget about yourself altogether. The deadly fault is that we come to judge the quality of our actions by the wrong standard — anything other than God, because only God is good. Luke 18:18-22; Mark 10:17-19. Crass Comparison is one way Satan turns worship away from God. It seems like he could have been a God-box checker. He asks Jesus what boxes he should check. Importantly, Jesus doesn’t say don’t check boxes, He tells the young man the first box to check. The young man must have been elated — I am already doing that, he may have thought. Then Christ asks for a radical transformation of the young man’s life. This was a box the young man did not want to check, at least at that point in his life. The problem with God-box checking is that it judges using the wrong standard. Yet, if the box checking is merely immaturity or a tool through which God is helping someone grow, then I see no problem with it. But I would not and I could not tell you all. Some things lose their fragrance when exposed to the air, and so,too, one’s inmost thoughts cannot be translated into earthly words without instantly losing their deep and heavenly meaning. How sweet was the first embrace of Jesus! It was indeed an embrace of love. I felt that I was loved, and I said: “I love Thee, and I give myself to Thee for ever.” Jesus asked nothing of me, and claimed no sacrifice; for a long time He and little Thérèse had known and understood one another. That day our meeting was more than simple recognition, it was perfect union. We were no longer two. Thérèse had disappeared like a drop of water lost in the immensity of the ocean; Jesus alone remained–He was the Master,the King! Had not Thérèse asked Him to take away her liberty which frightened her? She felt herself so weak and frail, that she wished to be for ever united to the Divine Strength. This is St. Thérèse de Lisieux describing her first Holy Communion in The Story of A Soul. If it all starts with desire, that Church Guy is heading in the right direction. Change is difficult. We should seek first to change and improve ourselves and have patience with others as they endeavor to change. Marriage is strengthened by our taking an interest in and sharing in each others activities and developing common interests. Marriage is made vibrant through continued courtship. Flowers, special dates, dining out, etc. keep a marriage fresh and help it flourish. Don’t take your spouse for granted. Communication is best achieved when we are attentive and when we are listening–when we make an effort to share feelings with each other. Be observant to notice “unspoken” communications and needs. Teachers have the three “R’s”: Reading, ‘riting, and ‘rithematic. From Father Francis Peffley, Catholics now have the 18 “C’s” for a stronger marriage in 2011. To encourage a better focus, I will post six (today, Wednesday, and Friday) in three parts. (Of course, you can cheat and go to Fr. Peffley’s website!). What does each “c” mean in the context of your particular marriage? Share any thoughts and ideas about them in the comments. It would be helpful to bring the leaven of experience to bear. . .
All vocations require dedication. Through thoughtful and loving effort, we can strengthen our marriage. The sacrament of marriage provides the grace to remain committed. We show that we truly care through our love and acts of affection, attentiveness and concern for our spouse and family. We all thrive on sincere and genuine compliments. A kind word fuels and sustains the good efforts of each family member. When we really care, we are moved to stop and to share in and feel the suffering of a family member just as the Lord did for us. We can solidify marital love and harmony and we can avoid conflict through our flexibility–our willingness to give in and accommodate others. Like all Catholics, the Papacy is special to me as a crucial part of Catholic identity. John Paul II was much more than that. He was larger than life and man overflowing with charisma and holiness. He attracted, and then bound, me to the Catholic Church. Benedict XVI is different. His style of leadership is quieter. We don’t have foreign trip after foreign trip. We don’t have the same glamor as John Paul II. Yet, with every passing day, I am more and more grateful to the Lord for giving us Benedict XVI. These are strong words, especially in diplomatic circles, but words that he nonetheless has not hesitated to utter time and time again (as any search of the Vatican’s website for “China” will show). Benedict XVI’s unflinching courage reminds the world that there is truth and that it must be spoken. Never before had I understood the idea of being “poor in spirit” as well. 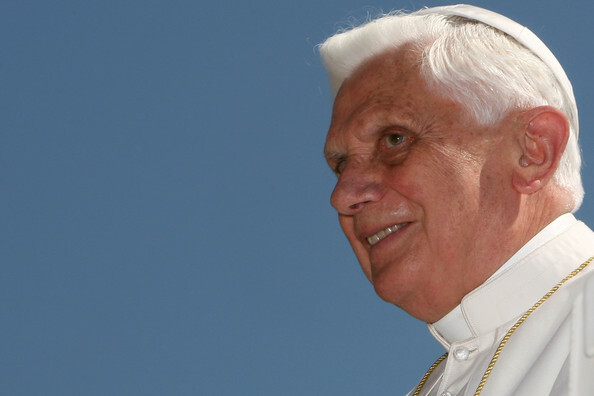 Benedict XVI’s lucidity turns the challenge into living the words, not understanding them. The final quality is humility. Even though he is the Holy Father, Benedict XVI exudes the poverty of spirit which he described in Jesus of Nazareth. When he boldly speaks the truth, it never seems that he is saying believe this because it is I, Benedict XVI, who is saying it. Rather, Benedict XVI says what needs to be said because the Lord has asked him to say it. Benedict XVI’s courage comes from his humility. His forcefulness comes not from self-assertion, but his humble desire to serve the Lord. For all of these reasons and more, I offer a word of thanks to our Lord for choosing Benedict XVI to lead us.